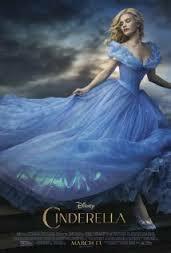 There are some good things about Kenneth Branagh’s newest incarnation of Cinderella. The costuming is beautiful. There are two actresses from Downton Abbey appearing in the film (Rose plays Cinderella and Daisy is one of the stepsisters). Other highlights include the evil stepmother played by Cate Blanchett. And perhaps the most memorable feature is the CGI, the Computer Graphic Images that enable the fairy-tale to be updated for the 21st Century. This would have been a chick flick, in another era. But post-modern feminists would deplore the banal message sent to young women. Cinderella’s enduring theme has been that your life begins when your prince arrives. Although in the post-modern era, there could be a socio-economic message about income inequality hidden within the plot. That may be stretching it. And though the plot is thin, the visuals are beautiful and the message is the same. As films go, there’s not much here. The message is pretty banal. Cinderella is told by her dying mother to stay strong and be kind. It is the same message found within fortune cookies and Girl Scout troops. But young children will love the rich and colorful scenery, and the movie is family-friendly and innocuous enough to be viewed by old and young alike. There’s a strong thread of banality that runs through many of the plots these days. Cinderella has a weak message but a strong foundation. The mythological quality of the story and the timeless elements weave through the thin narrative. This is not to be recommended for lovers of Shakespearean theatre. For that crowd, you should rent Brannagh’s Henry Vth or As you Like it. If you have young children or simply want to become immersed in a fairy tale for a few hours, then this is the movie for you.